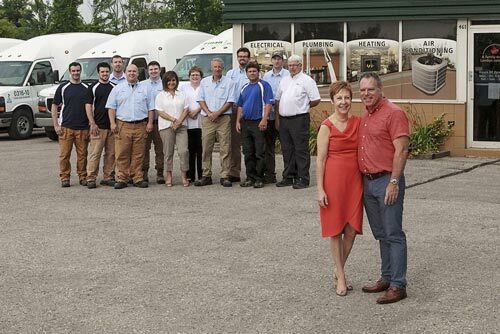 John Finan started Finan Electric in 1994, with the goal of creating a homeowner friendly and safety-oriented Home Service company. Now, John and Finan Home Service have a reputation for top-notch service with safety as a top priorty. Finan Home Service offers a complete set of services for keeping your home warm and cozy during the winter months, and fresh, clean air solutions. We cover everything from furnace install and repair to financing and home protection plans. We’ve got you covered and cool with our Cooling Home Services. With everything from installation to service and repair for your air condition at home, Finan Home Service will be able to help you with any of your cooling issues. Finan Home Service offers both emergency and non-emergency electrical services. Whether you need something fixed right now or have plans for a future project, get in touch and we can help you determine the most efficient and safest way to complete your electrical work. Having a plumbing issue can cause damage in your home and lots of frustration. Finan Home Service will work efficiently and effectively to recommend the best solutions to your problems and avoid further damage to your home. Whether you need us to take care of one small problem in your home or have a large project in mid we will help you through the process from start to finish. We pledge never complete any work without giving you a full list of options and the cost of having that work done.